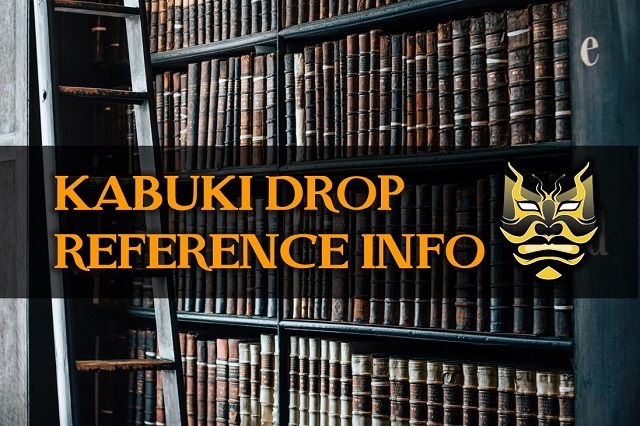 Here is a comprehensive list of Kabuki Drop reference information that were used when researching, compiling and writing this Kabuki Drop resource. “Edo period.” Wikipedia. Retrieved on 15 Feb 2015. “Expression in Kabuki: Kabuki Maku (curtains).” Invitation to Kabuki. Japan Arts Council. Retrieved on 15 Feb 2015. Hamatani, Hiroshi. “The Nature of Kabuki and Bunraku Scenery.” The Asiatic Society of Japan. Retrieved on 15 Feb 2015. Shun’ichirō, Kanai. “History of Kabuki Sets.” GloPAD. Japanese Performing Arts Resource Center. Retrieved on 15 Feb 2015. “Kabuki.” Wikipedia. Retrieved on 15 Feb 2015. Lombard, Frank Alanson. “Kabuki: A History.” TheatreHistory.com. Retrieved on 15 Feb 2015. Leiter, Samuel L. “Historical Dictionary of Japanese Traditional Theatre.” Scarecrow Press, 2006. Retrieved on 15 Feb 2015. Petersen, David. “An Invitation to Kagura: Hidden Gem of the Traditional Japanese Performing Arts.” 2007. Retrieved on 15 Feb 2015. Leiter, Samuel L. “A Kabuki Reader: History and Performance.” M.E. Sharpe, 2002. Retrieved on 15 Feb 2015. Leiter, Samuel L, and Brandon, James R. “Kabuki Plays on Stage: Darkness and Desire, 1804-1864.” University of Hawaii Press, 2002. Retrieved on 9 Feb 2015. Halford, Aubrey S, and Halford, Giovanna M. “The Kabuki Handbook: A Guide to Understanding and Appreciation.” C. E. Tuttle Company, 1956. Retrieved on 9 Feb 2015. Ernst, Earle. “The Kabuki Theatre.” University of Hawaii Press, 1974. Retrieved on 18 Mar 2015. Leiter, Samuel L. “The Art of Kabuki: Five Famous Plays.” Courier Corporation, 1999. Retrieved on 18 Mar 2015. Scott, Adolphe Clarence. “The Kabuki Theatre of Japan.” Courier Corporation, 1955. Retrieved on 18 Mar 2015. Reynolds, Andy. “The Tour Book, Second Edition: How to Get Your Music on the Road.” Cengage Learning, 2013. Retrieved on 9 Feb 2015. Wood, Bethany, and Hamilton, Tim. “Elements of Production.” Narukami – The Thunder God (University of Wisconsin – Madison, University Theatre’s Spring 2010 Production). Retrieved on 18 Mar 2015. “Kabuki Glossary (H~J).” Kabuki21.com. Retrieved on 15 Feb 2015. “The appearance and utilities of a traditional set for the Kabuki performance of Aoto Zōshi Hana no Niskiki-e by Kawatake Mokuami.” PDF. Retrieved on 18 Mar 2015. “Screen Frames.” Screenchange.com. Chris Hitchens Ltd Screen and Stage Engineering. Retrieved on 20 Mar 2015. Megan. “The Art of the Kabuki.” Sew What? Inc. Blog. Retrieved on 15 Mar 2015. “Grommet.” Wikipedia. Retrieved on 20 Mar 2015. “How to Easily Install a Grommet in Fabric by www.creativedish.com.” YouTube video. Retrieved on 18 Mar 2015. Liz, Johnson. “How to Install Metal Grommets.” Sew4Home. Retrieved on 20 Mar 2015. “Kabuki Drop System Operation Manual.” Risam for show. Gerriets. Retrieved on 20 Feb 2015. Lynda. “Focus On: Single Kabuki Drapes.” Sew What? Inc. Blog. Retrieved on 15 Mar 2015. “Gerriets.” Gerriets. Retrieved on 20 Mar 2015. “Kabuki Curtain Drop (How To Build a Manual Drop.” YouTube video. Retrieved on 18 Mar 2015. “Drop curtain system.” ControlBooth forum. Retrieved on 18 Mar 2015. “The Ins And Outs Of The Kabuki.” Sew What? Inc. Retrieved on 15 Mar 2015. Lynda. “Focus On: Poor Man’s Kabuki.” Sew What? Inc. Blog. Retrieved on 15 Mar 2015. “Kabuki Drops.” PAPERCLIP. Retrieved on 15 Feb 2015. “Cloth Drop.” Blue Room technical forum. Retrieved on 18 Mar 2015. “CLS Studding Timber Suppliers.” Chiltern Timber Supplies Ltd. Retrieved on 19 Mar 2015. “DIY Kabuki Drop.” Johnfromarran.org.uk. Retrieved on 15 Mar 2015. “Linear Solenoid Actuator.” Basic Electronics Tutorials. Retrieved on 18 Mar 2015. “What Is A Solenoid Plunger?” wiseGEEK. Conjecture Corporation. Retrieved on 18 Mar 2015. “Design Guide for Linear Solenoids.” G.W. Lisk Company Inc. Retrieved on 15 Mar 2015. “Solenoid.” Wikipedia. Retrieved on 17 Mar 2015. “Electro Holding Magnet.” Industrial Magnetic Systems. Kendrion. Retrieved on 20 Mar 2015. “Electromagnetic lock.” Wikipedia. Retrieved on 17 Mar 2015. “Kabuki Solenoid.” Innovation Productions. Retrieved on 21 Mar 2015. “Holding Magnet.” Flints Theatrical Chandlers. Flint Hire & Supply LTD. Retrieved on 21 Mar 2015. “Armature Plates.” Flints Theatrical Chandlers. Flint Hire & Supply LTD. Retrieved on 21 Mar 2015. Fragoso, Jesus Chuy. “Kabuki Stage Setting Release Device.” Google Patent. Retrieved on 20 Mar 2015. “Double Kabuki Drop Explanation.” YouTube video. Retrieved on 17 Feb 2015. “Electro Kabuki EK2 Series.” Electro Kabuki. Magnet Schultz Ltd in England. Retrieved on 19 Feb 2015. “Kabuki G2 Curtain Drop System Overview.” Gerriets. Retrieved on 21 Mar 2015. “Kabuki G2 Curtain Drop System Components.” Gerriets. Retrieved on 21 Mar 2015. “Kabuki 50.” ShowTex. Retrieved on 21 Mar 2015. “BYU Men’s Basketball 2013 Kabuki Drop.” YouTube video. Retrieved on 18 Mar 2015. Lynda. “Focus On: Double Kabuki Drapes.” Sew What? Inc. Blog. Retrieved on 15 Mar 2015.